Tiara Derosa and her Mississippi Valley State Track and Field teammates wrapped up the Indoor regular season at Scarlet & Black Invitational hosted by Arkansas State inside the First National Bank Arena. 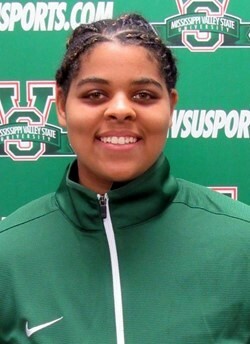 Derosa competed in the Women’s Weight Throw finishing 3rd with a top toss of 14.71m or 48 feet 3.25 inches. Derosa holds the Bermuda Indoor Record for the Women’s Weight Throw with a top toss of 14.89m or 48 feet 10.25 inches set a week ago.